I have serious issues when it comes to travelling light. Even for a one night stop over, I always pack as if I’m staying for a fortnight. I remember being about eight and having a meltdown when packing for my Brownie pack holiday as they were very specific about the quantity of items one little gnome could take with them. Everything from 1 x waterproof to 3 x pairs of knickers. Talk about strict. A girl must have options and back ups even from a young age. They should really award you with badges for being able to pack ridiculously light rather than ‘finding your way’ or ‘juggling’. Fast forward twenty years- my best mate is Sat Nav and the circus rejected me (not that I’m bitter) so those badges came in real handy, whilst funnily enough an app hasn’t been invented to help you pack light and prepare for all wardrobe eventualities! Anyhoo, so in the midst of changing up currency and printing our boarding cards, I began the mammoth task of packing for our holibobs, but I got a bit side tracked. 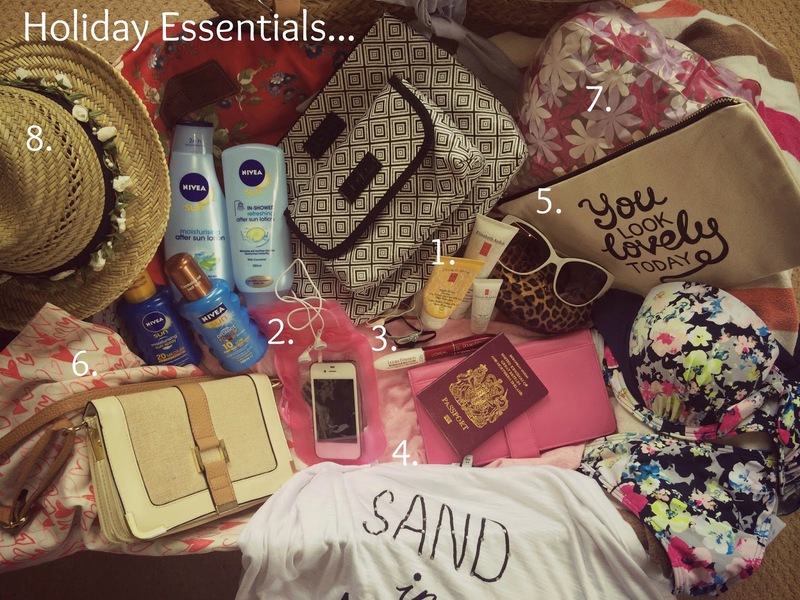 Instead of doing what any normal person does and actually packs their suitcase, I spent a little lot of time arranging my holiday favs and must haves specifically for this little post…bring on the sun, sand and gin & lemon, it’s holiday time…whoop whoop! Er hello amazing, magical and gorgeous smelling stuff. Every product in the EA Eight Hour range is amazeballs in my book and I particularly love the Elizabeth Arden Eight Hour Cream Daily Moisturiser SPF 15 (1) to use every day on face on holiday. For hotter days I use the factor 50 on my giant sun trap of a head. Lovely. There’s nothing worse than lying by the pool, listening to your summer playlist, when your other half decides to disrupt your serene sun goddess state with a good old wave of water. But with this bad boy- an iPhone Waterproof Pouch (2) you can sunbathe in peace (well sort of) knowing that your iPhone will be safe from sand and water. I’ve brought us all one of these for our holiday just to be on the safe side! L’Oreal Double Extension Mascara (3)– This mascara is a brilliant waterproof alternative as it only comes off in the shower using warm water to gently wipe the mascara off your lashes. I find it stays put all day long, even if I’m in the sea or the pool and then I remove in the shower and reapply at night leaving it on for the following day. Probably a beauty no-no, but it’s worked for me for years. If like me, you tend to stay in the sun until it sets, you’ll need a cover up at some point in the afternoon and this year I’m loving this ‘Sand In My Hair’ (4) shirt from Next. I always carry a small bag inside my beach bag to contain all those little bits that usually get lost and covered in sand. This year I’ll be using this canvas pouch (5) to save hunting for sand ridden lip balms and tissues. 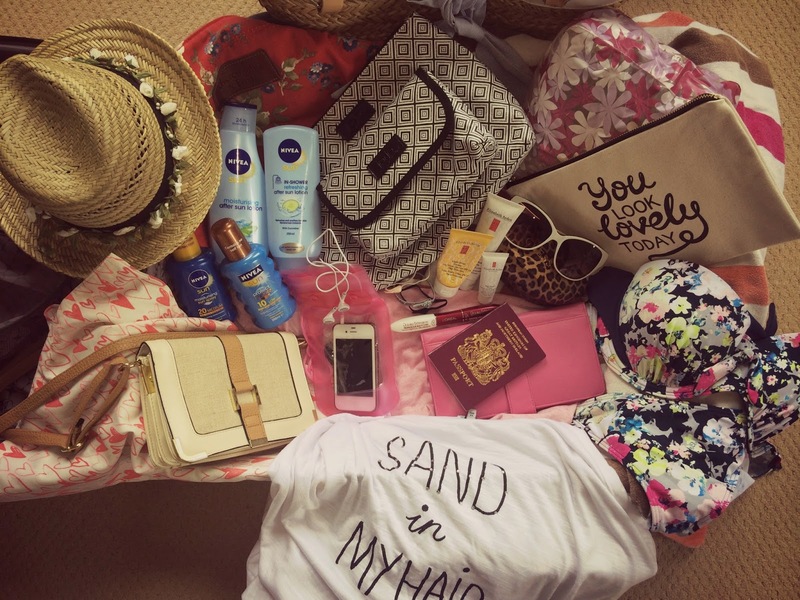 Also having a light canvas bag (6) in your beach bag for spontaneous shopping trips in between topping up your tan is always handy! Inflatable Beach Pillow (7)– Don’t laugh, but I do like a pillow when I’m sun bathing. I find it easier to read and to socialise whilst lounging around the pool. Plus it comes in handy for car and plane journeys too. Zzzzz…! Aloe Vera Gel– this stuff is AMAZING for any form of sun burn or heat rash. I used to suffer with severe heat rash (until we realised that I was actually allergic to Piz Buin) and I relied on prescribed antihistamines which always knocked me out (either that or my sangria was consistently being spiked) and the Hubster trekking to find aloe vera plants to soothe my pain…cue hunky Bear Grylls moment…! 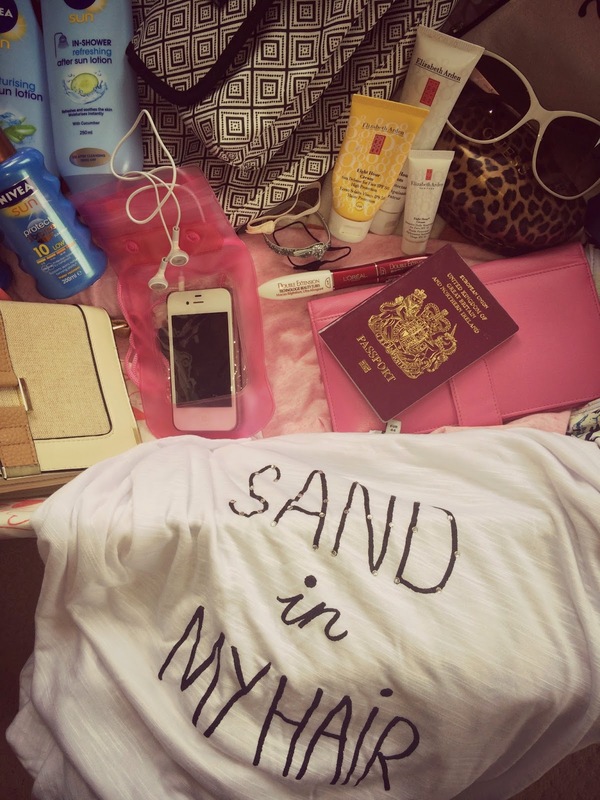 What are your holiday essentials? Let me know in the comment box if I should be packing anything else into my not so empty suitcase…I can always find room in the Hubster’s!